Hamlet 2. Dir. Andrew Fleming. Screenplay by Pam Brady and Andrew Fleming. Perf. Steve Coogan, Catherine Keener, David Arquette, and Elisabeth Shue. 2008. DVD. Universal Studios, 2008. My parents (God bless 'em) gave me the DVD of Hamlet 2 for Christmas! Hurrah! What's more, we had the opportunity to watch the whole thing last night. Huzzah! But when it comes to reviewing it . . . well, I just . . . don't . . . have . . . the words. It's—unfathomable. I can certainly say that it's not for all tastes. It's odd. It's quirky. It has a lot of language. [Let me clarify that: it has a lot of bad language, most of which was grauitious.] And it has scenes in which Jesus arrives in Elsinore in a time machine that he gives to Hamlet so that he can go back in time to prevent Gertrude's poisoning and Ophelia's drowning. But I thought it worked quite well. There were some very funny moments—moments that parodied the "endearing teacher inspires students" movie genre. And the production of Hamlet 2 (aptly enough, the play-within-the-film) toward which students and teachers are moving and of which we get pieces near the end of the film is very intriguing. 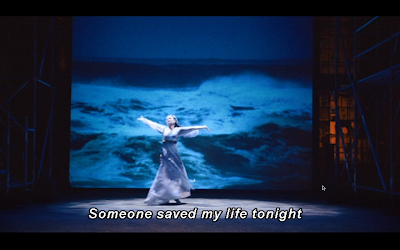 The image that heads this post is from that production—Ophelia spins in front of a giant seascape video while a glee club sings a version of Elton John's "Someone Saved my Life Tonight." Visually, it's a cross between Peter Greenaway's Prospero's Books and A Midsummer Night's Rave. Whatever else might be said about those two visual styles, they can't be called boring. And the plot itself is well-crafted. Though it's set in a high school, it doesn't spend too much time grappling with the emotions of the high schoolers—it's more interested in the drama teacher. Some of the funniest scenes involve his interactions with the school newspaper's drama critic. 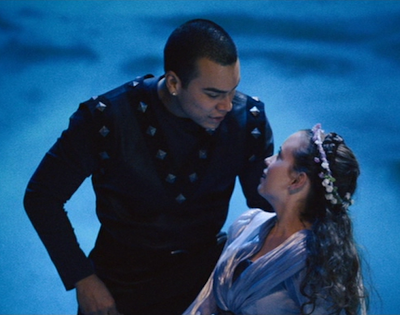 After reviving Ophelia with CPR, Hamlet looks at her with new eyes. The delightfully-named "Prickly Pear Fertility Clinic." Links: Trailer. Official site. Previous Post One. Previous Post Two. Previous Post Three. The Film at IMDB.